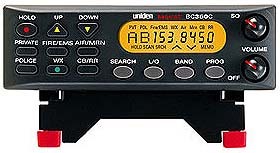 Features: The BC350C includes the most interesting "action" bands where you can hear police, ambulance, fire, amateur radio, public utilities, weather, and more. Frequency coverage 25-54,108-174,406-512,806-956 (excluding cellular). 100 user programmable memories - lets you quickly store interesting frequencies for rapid recall. Backlit Display - at the push of a button, our unique luminescent LCD screen is backlit so messages are easily read in low-light situations. Scan speed - 100 channels per second.